Headed home! After spending the last few weeks on the go, Kate Hudson and her partner Matt Bellamy were photographed at Los Angeles Airport heading home with their boys Ryder and Bing. 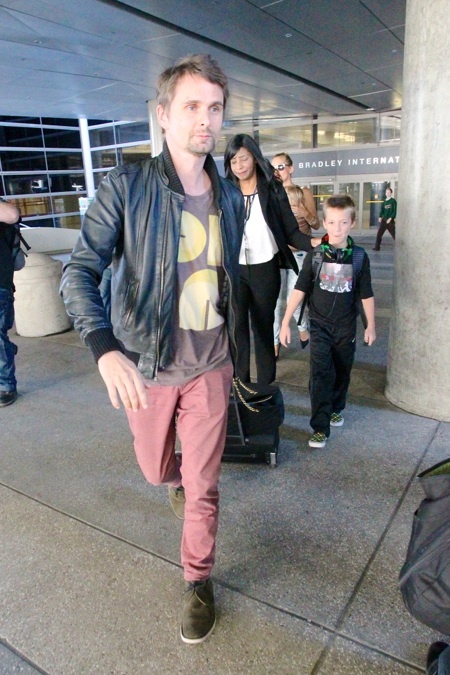 With Matt leading the pack, Kate carried Bing in a sling as she and Ryder made their way to a waiting car. For most of this year the Muse frontman has been on tour with his band, travelling across the United States and Europe. He has 2 weeks off now, before he heads to Japan for two dates and then on to South Korea. Kate has been busy filming a new movie, ‘Good People’ with James Franco in London. She also stars in a new campaign for Ann Taylor, along side her nephews Wilder and Bodhi. Often spotted making her way through the airport with her family, Kate acknowledges that the finding a balance between work and motherhood can be tricky.